For years, I have been dreaming up my ideal holiday girls' get-together. I'm convinced I not only found the solution, but I discovered my new annual holiday tradition: the Caramelized Cookie Swap! 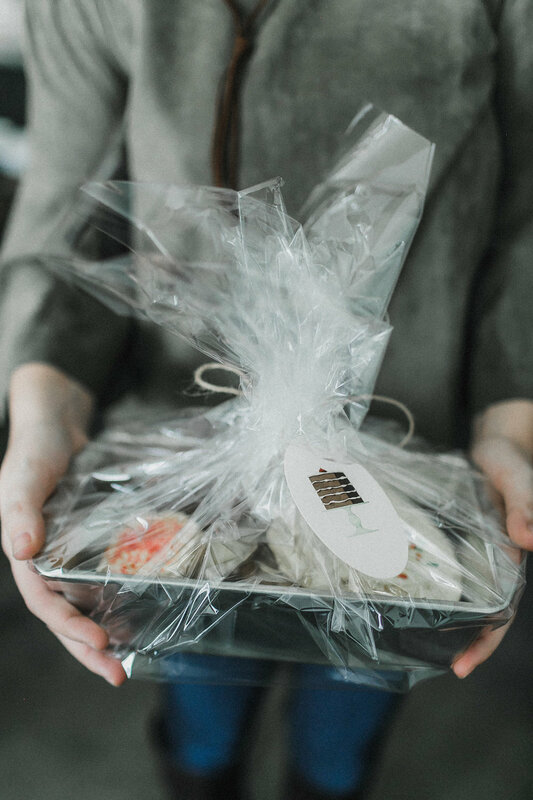 A few weeks prior, I sent a cookie-swap themed invitation via Paperless Post, my go-to platform for digital invitations that reflect the style and sophistication of my Caramelized parties. 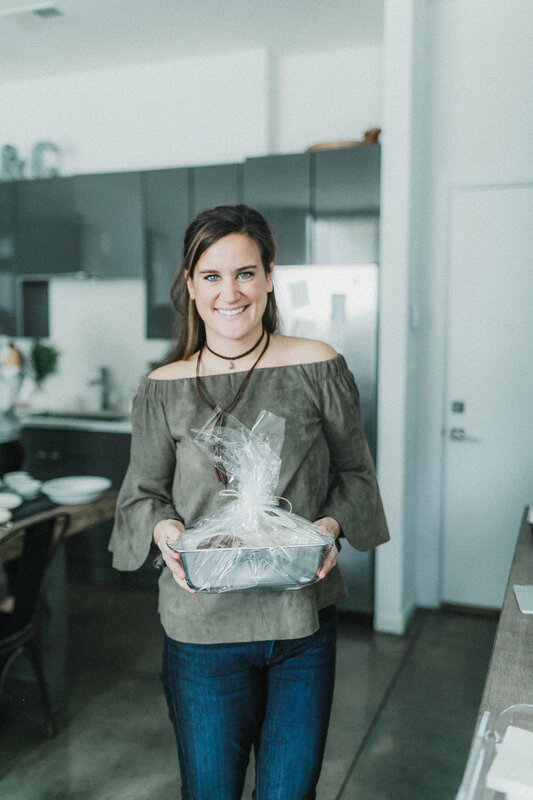 Each guest was asked to bring a dozen of her favorite homemade cookie recipe. Though a bit anxious that I had no control over the menu, I couldn't have been more impressed with my friends' creative array, ranging from lemon pistachio to oatmeal cherry toffee! 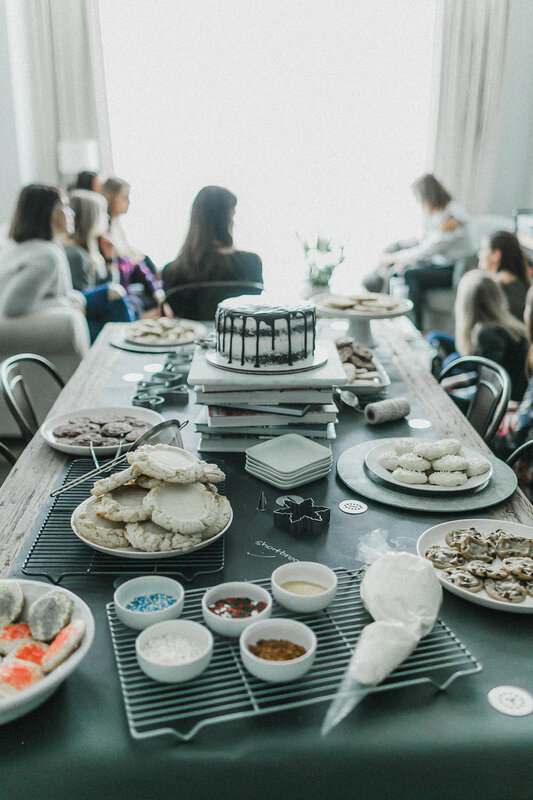 The dozen of us gathered on a late Sunday morning to share sweets, sip mimosas, decorate shortbread cookies with playful holiday sprinkles, commence in a top-your-own oatmeal bar, and catch up on all our crazy-busy lifestyles. Keep scrolling for entertaining details, as well as my favorite sugar "cloud" cookie recipe. My dining room table was transformed into the ultimate cookie presentation platform. 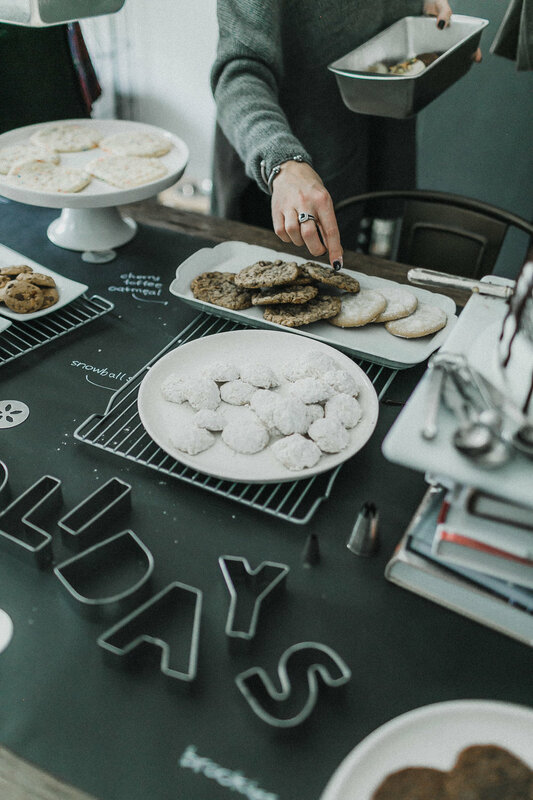 A chalk paper table runner provided the foundation for pops of white plates and colorful cookies; plus, its surface allowed me to label each cookie flavor on the fly with a chalk pen for clarity! 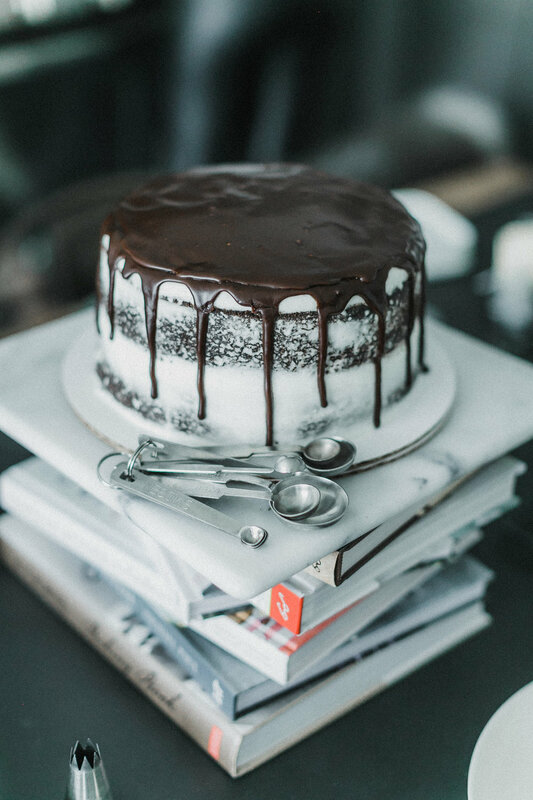 An especially appropriate centerpiece was a chocolate ganache "naked" cake with vanilla bean frosting from Sweet Cakes Bakery in Collierville, Tennessee. Its gorgeous presentation literally heightened the occasion -- on a stack of my favorite baking cookbooks, in fact -- while complementing the party's sweet-tooth theme. Stainless steel baking equipment and accessories dotted the tabletop, adding texture and structure to the otherwise simple white dessert plates. I especially loved how cooling racks anchored our cookie options, while icing tips and cookie press molds studded the display, just like ornaments on a Christmas tree! On the south end of our table, an interactive cookie decorating station gave each guest a chance to ice and sprinkle an oversized shortbread cookie. Chanukah and Christmas colors were available, as well as snowflake and gingerbread-shaped mini sprinkles! The girls loved the opportunity to customize their own amongst the already-prepared cookie choices. 1. Preheat oven to 300 degrees. Lightly spray 2 cookie sheets with nonstick spray. 2. In a large bowl, cream together sugar, butter, salt and vanilla with mixer. Carefully add cornstarch and flour, continuing to mix on low until just combined. 3. Form tablespoons of dough and place on cookie sheets, about 2 inches apart. 4. Bake for 25 minutes, or until slightly golden brown. 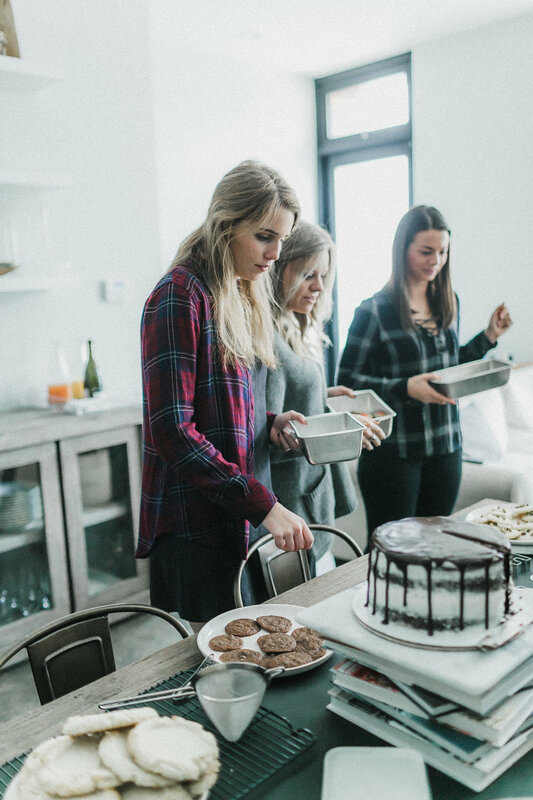 Allow to cool completely on cooling racks before icing or decorating. Instead of a traditional tin cookie box, I opted to use a functional baking tool for future gatherings! I handed each guest a bread loaf pan to fill with assorted cookies. We wrapped them with cellophane wrap, a twine bow and cake tag. The takeaway was truly precious!